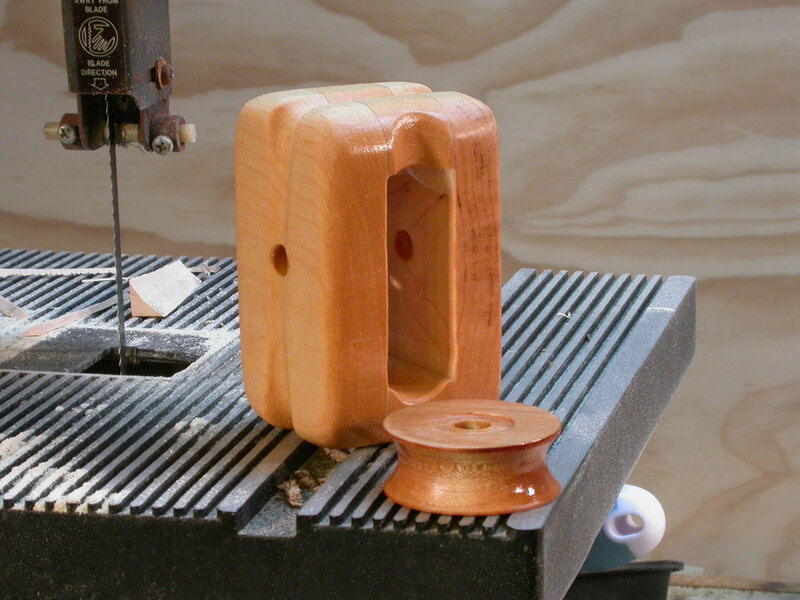 Last week I called my new Delta drill press the "Pride of the UnlikelyBoatBuilder's Power Tool Fleet". 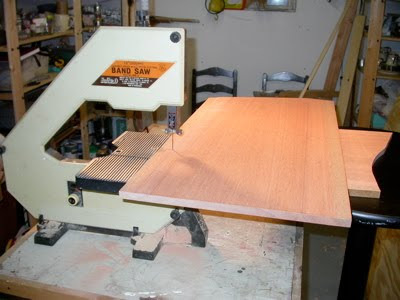 That got me thinking, because the pride of any boat builder's tool fleet should be his or her bandsaw. It's the perfect tool for many jobs, and practically indispensable for cutting out those long, curvy planks. I say practically indispensable, because I did indeed dispense with my bandsaw when cutting Cabin Boy's planks, for a variety of reasons. And lately, my bandsaw and I have not been on speaking terms. Maybe it was me dissing it in a public forum, or maybe the poor machine was just getting old, or maybe I just didn't know how to use it, but, bottom line, it would not cut a straight line. No matter how carefully I tried to guide it, it would veer off at an angle, usually ruining whatever piece I was working on. Eventually, in frustration, I banned the former Pride of the Fleet to a dark corner of my shop, until it repented the error of its ways. Then I started my wooden block project. Now, making wooden blocks is pretty complicated, as we shall see, but I was making good progress with a Japanese pullsaw that made beautiful cuts exactly where I wanted them. 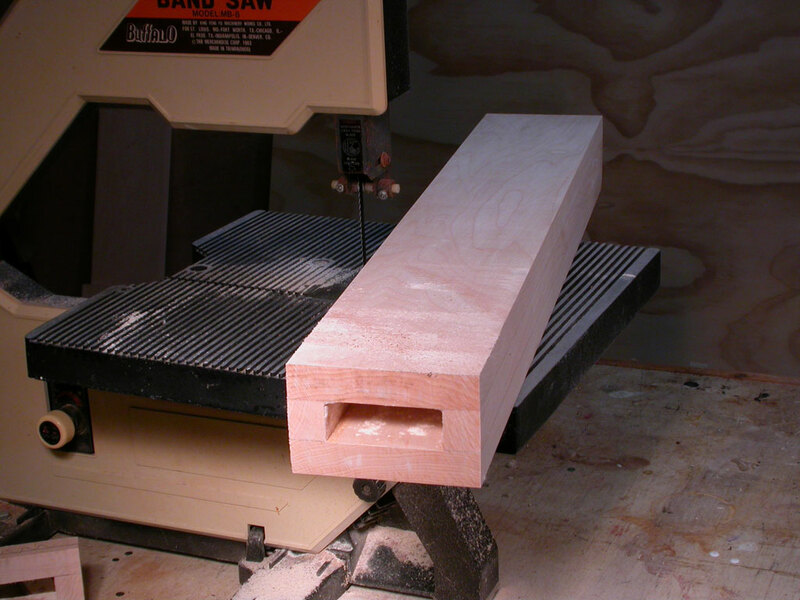 But a little voice kept nagging at me, saying, "Wow, this would be a whole lot easier with a bandsaw!" I decided to give old Buff one more chance. My bandsaw, by the way, is an old Buffalo 3-wheeler. Helena picked it out of a neighbor's garbage, and I fixed a switch, bought replacement blades, and generally cleaned it up. Once refurbished, it worked reasonably well. Until it turned ornery on me. After moving it to my work bench, I tried a few test cuts on scraps of 3/4" maple. Once again, it made crooked cuts, bogged down, and even burned the wood, producing clouds of smoke. "What a piece of junk," I thought. Then I had another thought... what if? I'd had a whole year's experience with woodworking since banning my bandsaw. That included lots of experience with dull tools. Could it be that simple? Since the Buffalo uses an odd-size blade, I'd had to buy replacements from a shop that made them up special. It was such a hassle that I'd bought 3 of them, just in case I had to replace the first one. I stripped off the old blade, replaced it with a brand new one, adjusted the tension, and tried another test cut. This time, the old workhorse cut through that maple like it was made of butter. No smoking, no bogging down, no crooked, veering cuts. That's when the title for this week's blog popped into my head: The Department of 'Duh!'. Did I think bandsaw blades were immortal? What was I thinking? It just proves that some lessons are worth learning over and over again. In this case: It's a poor worker who blames his tools. So old Buff is back on his pedestal: Pride of the UnlikelyBoatBuilder's Power Tool Fleet, once again. I'm on a mission to upgrade the Blue Moon's running rigging with stout, salty-looking gear. 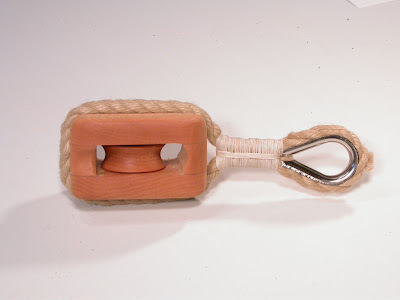 As I have time and money, I'm replacing yacht braid with 3-strand, and plastic blocks with lovely wooden ones. That's the vision, anyway. 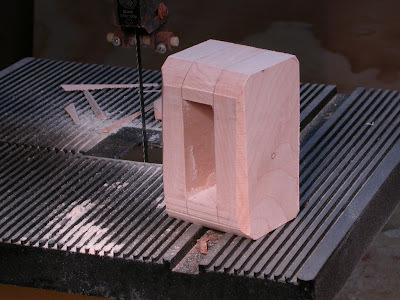 I'd never made a wooden block, but I was ready to try. I used as my guide, Derek Water's tutorial on Duckworks.com. I won't repeat the tutorial here, but will talk about troubles I ran into, and one significant addition I made. I started with the sheaves, because they seemed to be the most difficult bit. As Derek suggests, I cut out the blanks using my drill press and the best hole cutter I could buy at my local Big Box -- a Milwalkee. It turned out beautifully machined blanks. Unfortunately, the pilot drill was only 1/4" and I needed a 3/8" hole for the axle. Even with a drill press, my first attempt to expand the axle hole ended up slightly off-center. I eventually mastered the trick, but have ordered a 3/8" drill bit with 1/4" shaft, so I can drill the right size pilot hole at the same time I make the blank. It was much easier, and more fun, to cut the groove in the sheave. 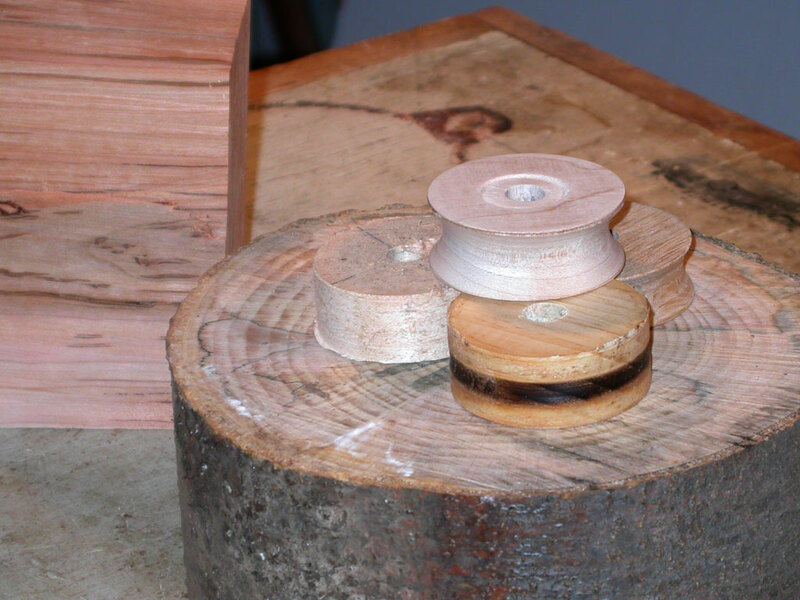 As Derek suggests in his tutorial, I turned the sheave with my drill press and cut the groove with a Microplane rasp. It took less time to do it than to explain it. Again, as Derek suggested, I glued up a long box, from which blanks could be cut. This box is big enough for 10 blocks. I used hard Maple, and epoxy. The trickiest part was making up the spacers -- the short strips of wood between the cheek blocks. These spacers need to be the right size -- just a bit thicker than the sheaves -- and dead flat. It took me several tries to get these spacers right. In fact, they were so hard to make that I stopped long enough to get old Buff working again. In the end, I cut them a bit over-sized in the bandsaw, then clamped them together, and planed them to the right size as a unit. That way, they both ended up the same size. 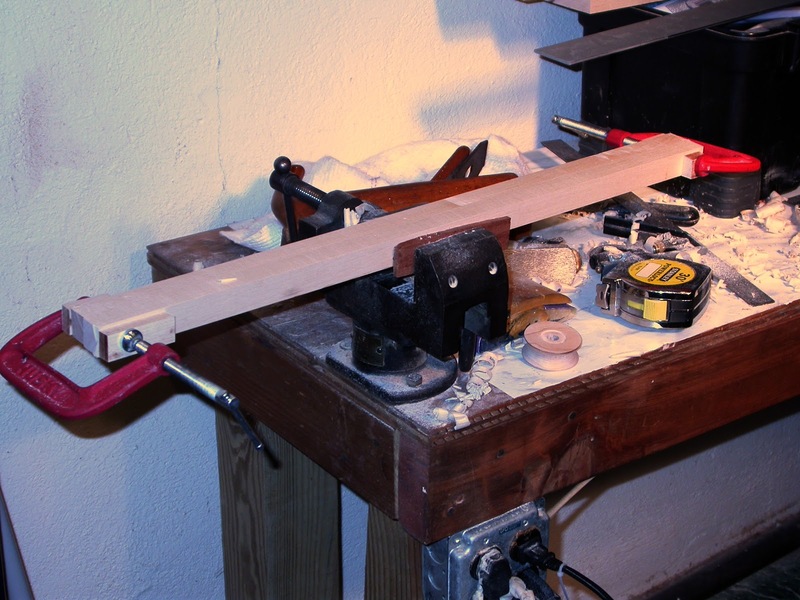 Once the long box was glued up, I cut off a blank and began shaping it. First, I used the bandsaw, freehand, to trim off the edges. 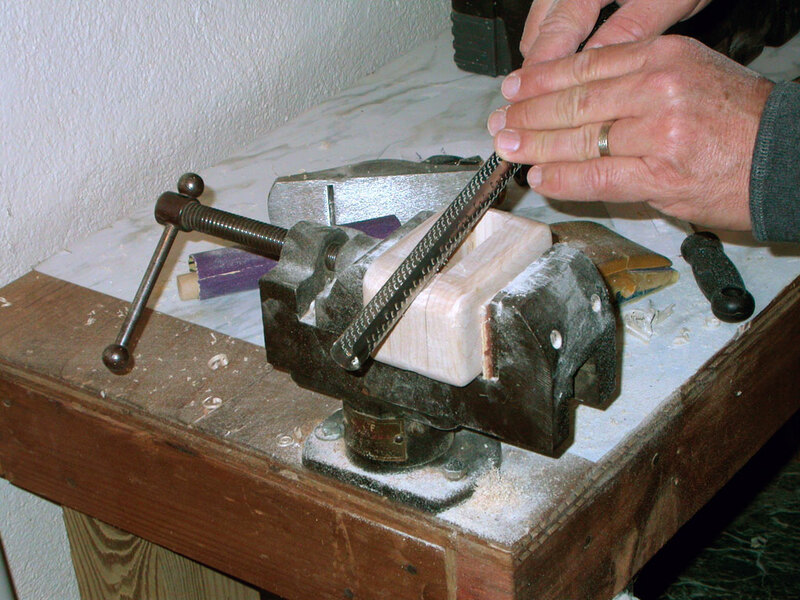 Then I used a block plane, rasp, and sandpaper to smooth and round the edges. I used several sized Microplane rasps to cut the various grooves needed for the strop and line. I'm sure there's a scientific way to do this, but I just did it by eye. It wasn't hard. Once done with the shaping, I dropped the sheave and shell into a bath of boiled linseed oil and left them overnight to soak. That's not really long enough, but I was in a bit of a hurry. They emerged looking smooth, oily, and gorgeous. I mentioned awhile back that I'd mastered the art of grommet making -- one of the many small skills you need to make rope-stropped blocks. Again, I recommend Brian Toss's tutorial in "The Rigger's Apprentice" if you haven't learned how to make these, yet. It took me several tries to get the seizing right. The trick, as I learned from experienced block makers on Wooden Boat Forum, is to seize the block and thimble in the strop under a full working load. This takes any stretch out of the strop so the block doesn't pop out at midnight in the middle of a gale. 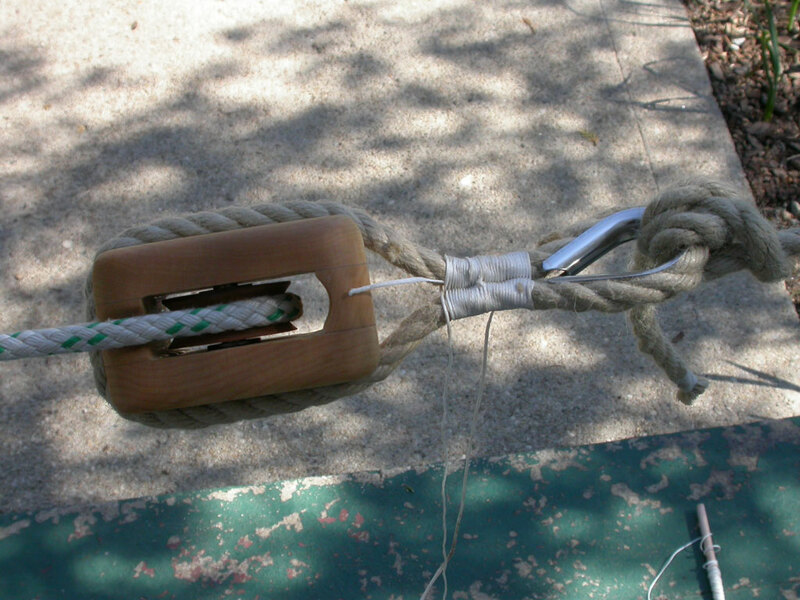 I put tension on the strop by stretching it as tight as I could between two trees, using another block and tackle. I had at least a few hundred pounds of tension on it. You wouldn't think you'd be able to draw the two parts of the strop together with a bit of waxed twine, but it was fairly easy. I wound the seizing twine on a primitive shuttle (laying on ground in photo below.) The shuttle made it easier to make all the wraps, and allowed me to haul the racking turns good and tight. The strop ends up hard as a rock. And here's my first finished block. Well, I say finished, but its really not. I've decided the strop is too long, and I want to use a round thimble, rather than a teardrop shaped one. But that's for another day. For now, I'm going to say 'good enough'! In case you are wondering, the wooden sheave turns beautifully on the bronze pin. I'm sure it will require a bit more maintenance than an oil-impregnated plastic one, or one with bronze bearings, but for now it works great. 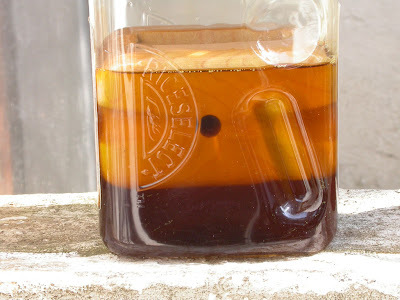 I'll oil it with linseed oil, and it ever distorts from pressure, it will be easy to replace it with a plastic or bronze sheave. Or, I could just make a new one! 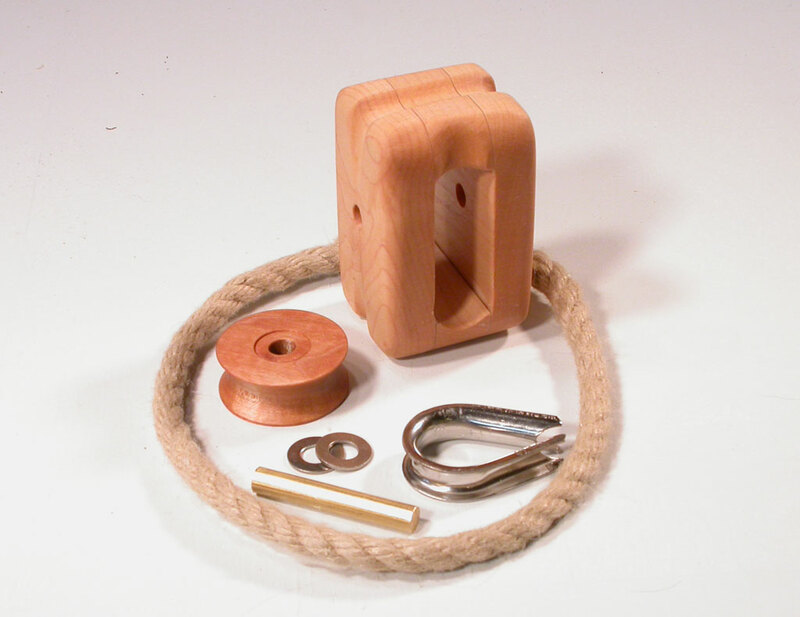 Which just goes to show, if you're smart enough to change your bandsaw blade on a regular basis, you're probably smart enough to make a rope-stropped block. >>> Next Episode: How Big a Boat? Pete: No, I never read that anywhere, either, though it makes sense as soon as someone mentions it. Great tutorial John. Stuffin' that away for future reference. Thanks. Definitely check out Derek's original tutorial, if you haven't already. It has a lot of detail that I've left out. Great tutorial and BEAUTIFUL work.